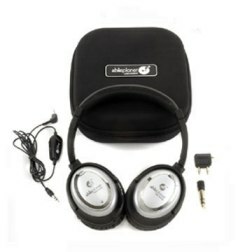 I had a chance to try out the Clear Harmony Noise Canceling Headphones from Able Planet. Generally, there isn’t much to say when reviewing a new pair of headphones, but I would definitely recommend a pair of these. What I liked most about these headphones was the comfort. The earphones are cushioned, and so is the bar that connects them. All of these cushions work together to insulate my ears from most outside audio noise. Not only could they really block out the rest of the world, but the full immersive sound was unique. Yes, the sound was good, but the headphones didn’t work the first time. I then saw a power switch but actually had to turn it to “off” to hear anything. Later on, I eventually turned the switch to “on”, and I could hear a lot of feedback hissing in the background. I’m not certain why there is a power switch, or what is powering the indicator light. Still, you can’t argue with the results of award-winning Linx Audio sound, which works well with a stereo, MP3 Player, laptop, or anything else with a headphone jack. The Clear Harmony can be purchased on the Able Planet website for about $349.99. It comes with a handy carrying case along with 1/8” and 1/4” adapters.